December 29, 2011  New Orleans has long been known as one of America's hardest luck cities, struggling over the years with poverty, crime, corruption and tragic disaster. But the city's darkest days have sparked a surprising new entrepreneurial spirit. December 24, 2011  Like other black Americans — considered the political base for President Obama — members of the close-knit Gaither-James family say racism is holding the nation back. November 23, 2011  The tabloids — with names such as Cellmates, Jailbirds, Just Busted — show mug shots of those arrested every week in different cities around the country. 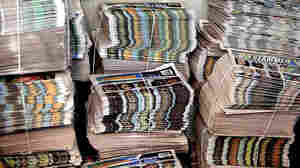 In Little Rock, Ark., The Slammer sells some 7,000 copies a week. But law enforcement says it doesn't help solve crimes — and others call it voyeuristic and exploitative. 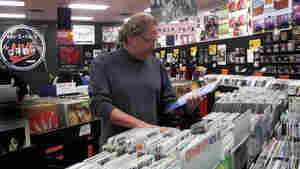 November 22, 2011  John Timmons recently closed ear X-tacy, a record store he'd owned for 26 years. "People have priorities, and music is just not a top priority right now. That's what's really taken its toll on us," he says. Now, Timmons has to figure out what to do with the rest of his life. November 10, 2011  Huntsville is the shining star in Alabama's economy. 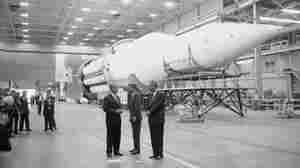 Scientists there designed the rockets that put man on the moon. In the past 50 years, it's become a magnet for high-tech space and defense jobs. But with NASA downsizing and the specter of defense cuts looming, Huntsville finds itself in limbo. 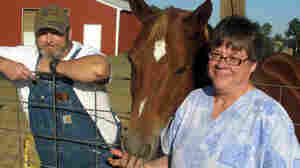 Norris and Janis Galatas at their home in Collinsville, Miss., with their horse, Cinnamon. The couple is struggling to make their mortgage payments. November 1, 2011  Norris and Janis Galatas had planned to be settled at middle age. But then Norris got wounded in Iraq and Janis lost her job. They're barely squeaking by, and they feel like the middle class has been left behind. "It's sad that the American dream is not even realistic anymore," Norris says. Farmer Scott Allgood, front, of Allgood, Ala., listens during a meeting of farmers and state officials to discuss the impact of the Alabama Immigration law on their livelihoods in Oneonta, Ala.
Labor Worries Rise As Planting Season Nears In Ala.
October 24, 2011  Alabama farmers are facing a labor crisis because of the state's new immigration law. So far, piecemeal efforts to match the unemployed or work release inmates to farm jobs are not panning out, and farmers are asking state lawmakers to do something before the spring planting season. 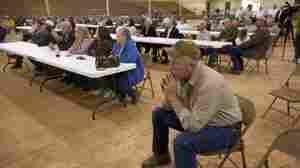 October 14, 2011  Alabama business owners are furious about the state's new immigration law. They say it is costing them business. Some wonder if the state will ultimately change the law, which is leading legal and illegal immigrants to flee the state. October 6, 2011  With a tough immigration law in effect in Alabama, worried Hispanic parents are meeting with school officials. They fear for themselves and their children. October 6, 2011  A federal judge has ruled that Alabama's strict immigration laws will go forward even as appeals are made through the judicial system. Hispanic-owned businesses in the state say their customers have vanished. Among other things, the new law requires police to verify the immigrations status of suspects if there's "reasonable suspicion" they are in the country illegally. 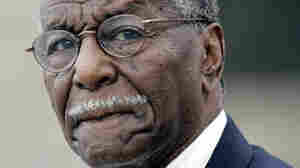 Civil rights activist Fred Shuttlesworth, hailed by the Rev. Martin Luther King Jr. for his courage and energy, died Wednesday in Birmingham, Ala. He was 89. October 5, 2011  Shuttlesworth led the battle against segregation in Birmingham, Ala. — a battle that focused the national spotlight on the violent resistance to equal rights in the South and forced change. He died Wednesday at 89. September 29, 2011  A federal judge has upheld much of a controversial Alabama immigration law, considered to be the toughest in the country. It takes effect Thursday. September 11, 2011  While far from the Sept. 11 crash sites, Murfreesboro is embroiled in a debate over the building of a mosque. According to the local imam, the attacks have become a political wedge between the Muslim community and some residents. September 6, 2011  Family of James Anderson files wrongful death lawsuit against a group of white teenagers. Anderson, a black man, was beaten up and run over in what authorities say was a racially motivated killing. The case is being filed by the Cochran law firm and the Southern Poverty Law Center. September 5, 2011  Republican presidential candidates are taking part in a forum in Columbia, South Carolina, today. Among the panelists asking questions will be Senator — and Tea Party favorite — Jim DeMint.